Yesterday I bought 25 pounds of fresh, organic broccoli from a local farm here where I live. They had too much so I got a good deal. Do you know how much broccoli 25 pounds is? It is a lot! I spend a lot of my day blanching and freezing all my broccoli so I could use it with our dinners in the future. I saved a few broccoli crowns to make a broccoli salad. One of my cooking clubs met last night and I was able to try out not one, but two different broccoli salads, for the *gasp* first time ever. I did not know what I was missing. Please make this salad. It is delicious. It is so fresh and light, and you can add your favorite nut or raisin/craisin/golden raisin, etc. that you would like. I chose raisins and almonds because I actually had those in my pantry. 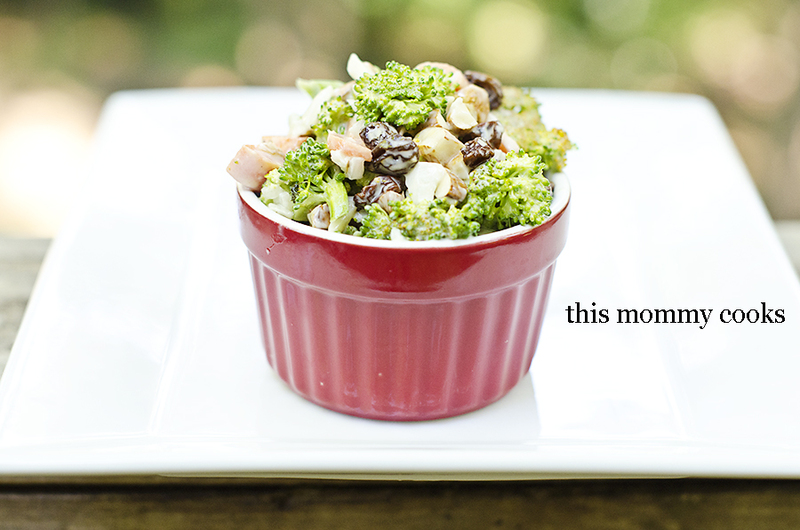 So with all the broccoli that is in season right now, let's make some broccoli salad! Enjoy! In a large bowl, combine mayonnaise, vinegar, sugar, mustard, and salt and pepper. Add in chopped broccoli, carrots, onion, raisins, and almonds. Stir until all of the mixture is coated. Cover and put in refrigerator until chilled. I love this recipe...full pack of nutrients with over flowing of veggies! I would like to add some creamer to make it creamer. Try also visiting my favorite site, GOURMANDIA.They have lots of exciting and interesting recipes for you to choose from. Not only that you could watch their recipe videos and could replay it again and again.